After reading a blog post by my Facebook friend and fellow writer Christina, I've decided to join the April A-Z Blogging Challenge. The idea is to post something new for each letter of the alphabet every day but Sunday, so that by the end of April, we have 26 new blog posts. I think it'll be not only a great writing prompt, but also a nice way to meet some new bloggers and (hopefully) get some new followers for my own blog. I'm trying hard to network and make connections so that when my book is ready to publish, people will know who I am and actually be interested and want to buy it lol. The last time I did anything like this was probably around 2004-2005 when MSN Spaces were the hot thing and we used to have 'blog walks' where different people would host topics, people signed up, then we'd make the rounds through participants. It was a lot of fun, but it was time-consuming and my then-ancient computer spent more time frozen than anything. This should be interesting because I've been having trouble finding balance and trying to stop procrastinating and this could be a whole new avenue of endless procrastination. In my last entry, I talked about working on a novel I had written several years ago. I've been doing well with that, and I'm partway through working on chapter three. I need to add 25-30,000 words for it to be novel-length, and so far, it's easier than I thought. It's amazing how seven years can change your perspective. When I first wrote the book, I couldn't see any ways to flesh it out or change it to make it better or longer, and now it's just so natural. AND I'm actually having fun with it, which is important, I think. 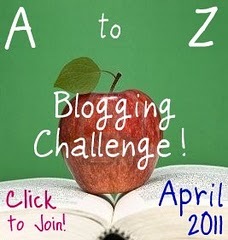 Looking forward to the A to Z Challenge, which starts Friday! If you're interested in joining, just follow the link at the top of this post, or click the button in the right-hand column. Glad you can join us for the Challenge! Let me know if you have any questions and thanks for spreading the word. Thanks Alex! I'm glad I came across the challenge, I'm really looking forward to it! It sure sounds like it, Lynda!